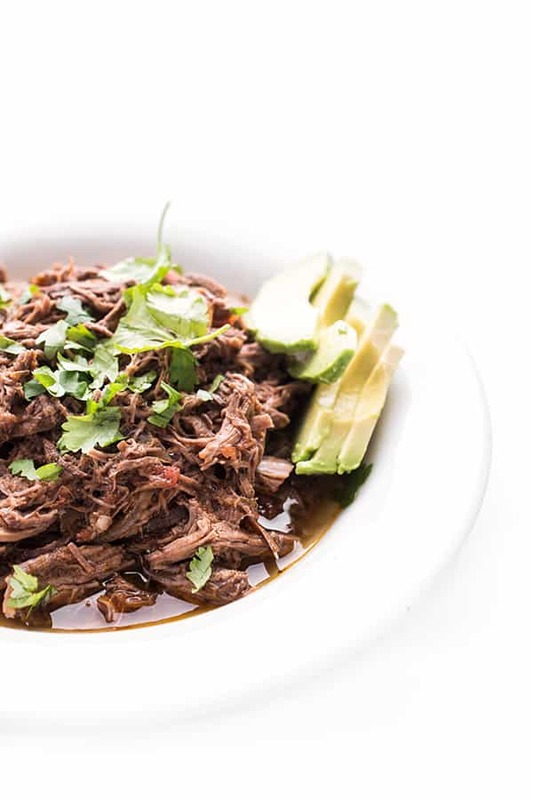 Save time with this simple Slow Cooker Shredded Beef. Juicy, flavorful and easy to make, you will love having this beef on hand all week long. I’m not sure if it’s because spring is taking its dear sweet time to arrive or because my life has never been busier, but my love for slow cooked foods has never been stronger. There was a time when I only used my slow cooker a few times a year but these days, it is my favorite time-saving tool in the kitchen. Slow Cooker Shredded Beef could not be more flavorful or any easier to make. To start, you put together a quick spice rub made with ingredients you have in your pantry such as garlic powder, cumin and dried oregano. Feel free to make a double or triple batch of this spice blend to use the next time you make fajitas, tacos or chili. For added charred goodness, I love using fire roasted tomatoes. I’m not sure what it is but I’m incapable of slow cooking beef roasts without a tomato product of some sort. For added depth of flavor, I like to cook the roast in beer. Much of the alcohol burns over during the long cook time but the deep, rich flavors of the beer will provide subtle background notes in every single bite. Feel free to swap it with beef broth to keep the dish alcohol free. 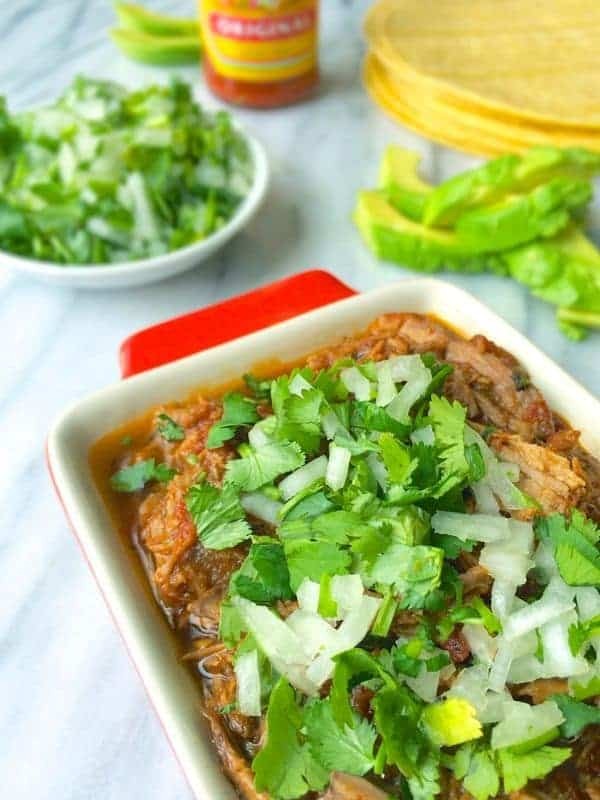 Slow Cooker Shredded Beef tastes delicious on it’s own (my husband’s favorite way of eating it) but I love using it all week long in Mexican soups, tacos, salads, chili, quesadillas and more. Mix together all of the spices (cumin through chili flakes) and rub spice blend evenly on the beef roast. Cover spice-rubbed roast in plastic wrap and refrigerate for 2 hours or overnight. In the morning, place onion slices on the bottom of the slow cooker insert then top with beef roast, diced tomatoes and beer. Cook on Low for 8 hours or on High for 4 hours. Shred with two forks before serving an garnish with cilantro if you wish. Recipe can easily be doubled for larger roasts. Shredded beef is delicious on its own or can be used throughout the week in fajitas, quesadillas, soups and more. Wow! Made this for tonight’s Shabbat/Hanukkah dinner. Was amazing and perfect with latkes. Thanks! What a wonderful idea to serve with latkes!! Happy Hanukkah! I would have to try this in the oven, because I got rid of my slow cooker. The crock picked up some kind of nasty odor that permeated the house every time I used the cooker, and I could not find a way to get rid of it. I would probably cook it at 250º for at least 4 hours (I have no idea what slow cooker temperatures are for their high and low settings), and then test it for doneness. The oven is the ideal slow cooker!! I hope you enjoy!! I wish I had started this today so we could have it for dinner! Yum! Slow cooker anything saves the day! These are perfect for today. 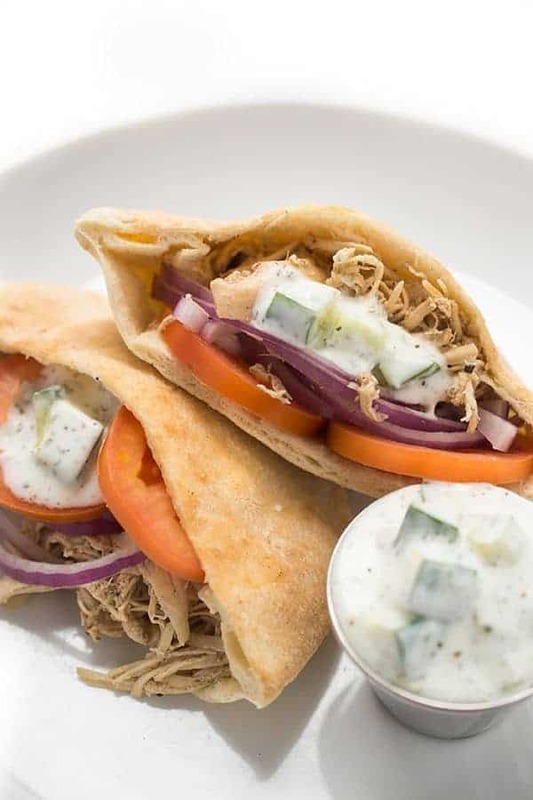 Love easy slow cooker meals! Bells is my favorite too-love that you used that to add flavor. This would be perfect on nachos or quesadillas. Happy Cinco de Mayo! I love that you know bells!!! And this is going to down in like 5 minutes! Oh, and you know I’ll sprinkle some tots on it. P.S. I get to see you next week!!!!!!!!!!!!!!!!!!!!! Omg I can’t even believe it!! NEXT. WEEK!!!!! I’m going to have to pretend to be calm and mellow when I see you so I don’t scare others. I hope you like it Leah!! I cannot imagine how amazing your house must know when you come home to a slow cooker filled with this goodness. Love! It was so freaking tasty!!! And I don’t even leave the house some days lol! !